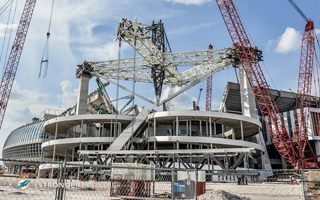 The Miami Dolphins have stated they fully expect the reconstructed stadium to be operational in time for their August 25 preseason opener but, as the Miami Herald reports, Miami athletics director Blake James has been forced to scrounge together a contingency plan in the event the stadium is not ready for the ‘Canes’ Sept. 3 opener opposite Florida A&M. That would likely call for Miami to use Florida International’s FIU Stadium with the Golden Panthers hosting Indiana two nights prior. Miami is also home the following week against Florida Atlantic which, as Tom Fornelli points out, could lead to the entertaining scenario of Miami hosting FAU in FAU’s own stadium. (Marlins Park is not an option either night). Below is the comparison between March 21 and the desired situation just 5 months later, in late August.